St. Martin's Press, 9780312360399, 144pp. The frantic pace and casual attitudes of modern life have made real friendship a rare experience. 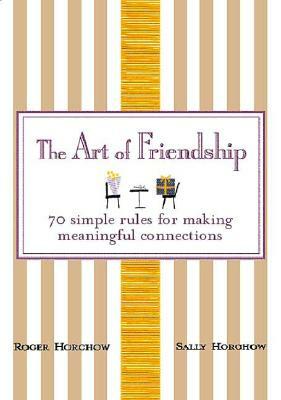 "The Art of Friendship" shows how making true connections can greatly enhance one's life. Seventy brief essays present simple but effective "rules of connecting" with action points to help you put each rule into practice in daily life. Woven throughout are personal anecdotes from the Horchows, sharing their experiences of friendship. Recognizing that friendships take many forms, the authors offer practical, proven advice that demystifies the process of making friends. "How to create rapport-- even in a crowd"
"How to transform an acquaintance into a friend"
"When to e-mail, pick up the phone, send a note, or meet in person "
"How to maintain long-term friendships ""--and even when it's time to quit"
The book opens with a foreword by Malcolm Gladwell (author of "The Tipping Point") that explores the Horchows' special talent for making and keeping friends. Whether your goal is to start a new relationship or reinvest in a longstanding friendship, this inspiring book will reveal how you can build more meaningful connections in your life. "The premise of what Sally and Roger Horchow have written is that The Art of Friendship has a few simple guidelines that anyone can be taught -- it's a good deal easier to learn something that looks very difficult from the outside if you're being taught by an expert and trust me, in the case of the Horchows senior and junior, you're in the hands of experts." -- Malcolm Gladwell, bestselling author of "The Tipping Point"
"This father-daughter collaboration, a from-the-heart and from-the-hearth little book, is simply a rare jewel in today's hardened, unkind society. It's full of great advice, love, and common sense. There is no better combination. In fact, I think it's a great antidote for anything that emotionally ails you." -- Letitia Baldrige, author of "New Manners for New Times"
"Friends are hard to come by, hard to keep, and sometimes hard to get rid of. Here's a book that helps on all scores. If I didn't already consider Roger & Sally Horchow to be good friends, I'd certainly want them to be after reading this wise and charming book." --William F. Buckley Jr.
"Roger Horchow has made a success of everything in his full life: as a husband and father, as a remarkable, innovative businessman, as a brilliant Broadway producer, as a generous donor to the things he believes in, and as a warm, supportive, permanent friend. In this little book, he and his daughter, Sally, combine to reveal Roger's secret formula for success: reach out, give more than you receive, persevere, and remember all we really have on this earth is each other." -- Robert K. Massie, historian and author of "Nicholas & Alexandra"